“History’s Mortar: Ambition” is a site-specific exhibition of visual art at Fort Point. Four Bay Area artists were invited to explore Fort Point’s history, architecture and landscape, and compose the Fort’s historic narratives into contemporary modes of visual art. These site-specific works bring the collective experience of the US History to bear, reveal how a contemporary public narrates historic space and examines humanity’s relationship to nature. “History’s Mortar: Ambition” asks the audience to consider the cyclical nature of human history, marking that it often repeats itself, and presents ideas as to how society copes with it’s legacy of ideologies, ontological positions, and cultural practices. 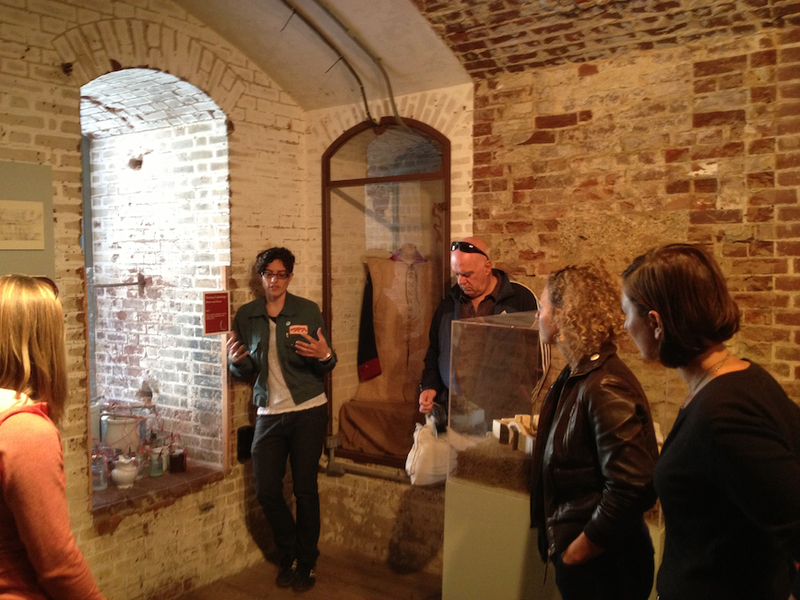 “History’s Mortar: Ambition” was part of We Players 2013 site-integrated project, Macbeth at Fort Point. Fort Point is an impressive display of technology and military architecture. Walking through the compound archways and the extraordinary symmetry rendered by compass, right triangle, rule and hand creates an experience of awe. The backdrop to Fort Point is an equally extraordinary feat of engineering, the Golden Gate Bridge. It towers above sea level, humming with traffic, stoic against the weight of human bodies and the endless winds of the Pacific. But before there was the bridge and before there was Fort Point, there was humanity and its inability to cope with its own folly, particularly an individual’s rise to power. That particular thread of seemingly endless human ingenuity never fundamentally changes; only the spectacle and the tools utilized to bring about a dismal end evolves. The site specific artworks created for Fort Point echo the folly of human history, our symbolic projection of power, and the natural forces that seemingly thrash ambition into submission. The artwork by Matt Gordon responds to Fort Point with the refrain from “The Lament for the Markaris,” by William Dunbar, commenting on the ever comforting and contemplative aspect of death. Monica Lundy’s Portrait of Confederate Commander James Waddell reminds us of our particular vantage point on history, rendering a leader of men as a weed because of his allegiance to the wrong side of the war. Torreya Cummings simulates mankind’s belief that nature can be captured and put inside a box, controlling it in theory, but ever failing in practice. And Brandon Olsen reminds us that the spoils of war bring about a kind of transformation we rarely deal with or speak to publicly, surrender. Fort Point is brilliant in its architecture, prowess and stoicism. Yet for all of the effort and technology used to bring it into existence, it’s design was never coupled with its purpose. Having never witnessed battle, Fort Point has lasted these hundred years to remind us of fear reconciled with power and security, and the inevitable purposelessness of creation out of fear.